This morning I woke up and I didn’t want oatmeal for breakfast. It was incredibly traumatic for me. I had a hankering for my favorite comfort food of all time. I’ve talked about it before, but that was way back in November, so you probably don’t remember it. I am talking about cornbread. I woke up with a desperate need for cornbread. The big problem I was having with this craving was that I was out of Jiffy Mix. As I previously explained, I’ve grown up on Jiffy Mix. I love Jiffy Mix. There are many processed, packaged food items that I have given up over the last few years. Mostly because things made from scratch are generally better. Except when it comes to cornbread. Every single time I try someone else’s cornbread, I get depressed. It doesn’t taste right. It doesn’t taste like Jiffy. Due to this, I always make it from the mix. 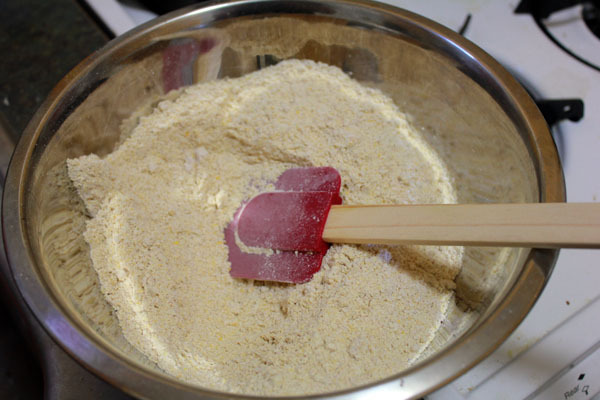 I checked my kitchen for supplies and I learned that I did have cornmeal. I bought it the last time I hit up the bulk bins at Rainbow Grocery. 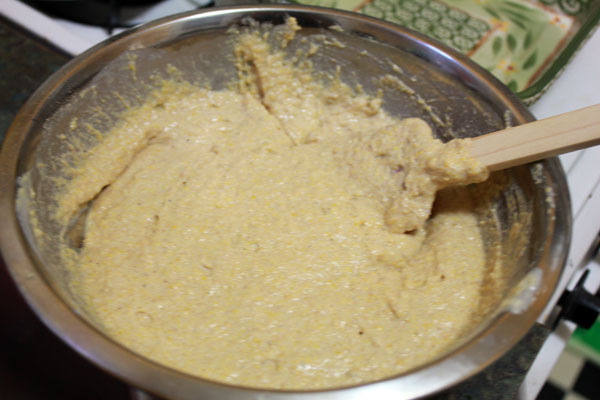 I had plans for cornmeal cakes, but never got around to it. I had buttermilk. I checked a few recipes, from Paula Deen’s to just random things popping up on people’s blogs. None of the recipes were really grabbing me. I looked up recipes for Whole Wheat Cornbread. Those weren’t all that exciting either. 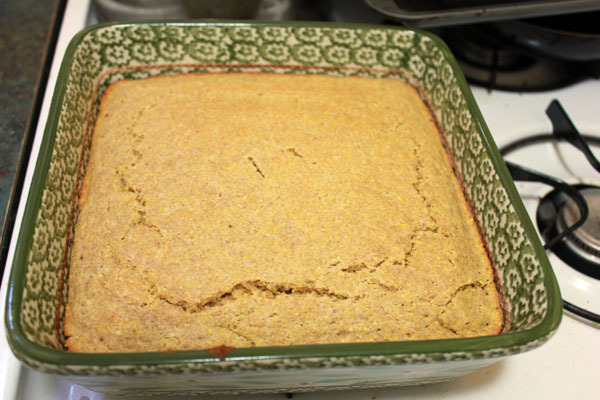 After checking the pantry once more, I decided to make Spelt Cornbread. I was feeling pretty impressed with myself until I googled that and found out that tons of people had done it before, including Ashley at (never home) maker. Oops. Guess I’m not special after all. Sniff. 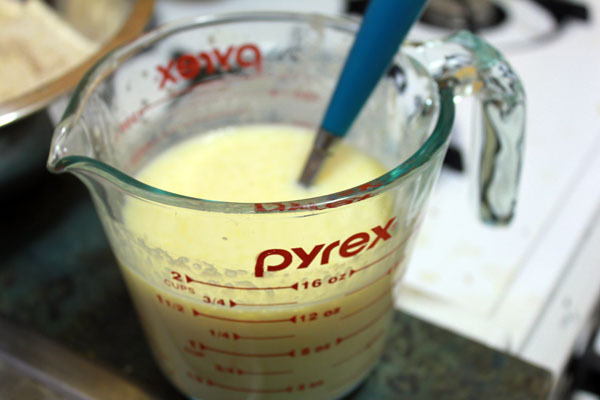 1.5 cups reduced fat buttermilk, 4 tablespoons of butter (melted), 1 egg, 2 tablespoons of maple syrup. 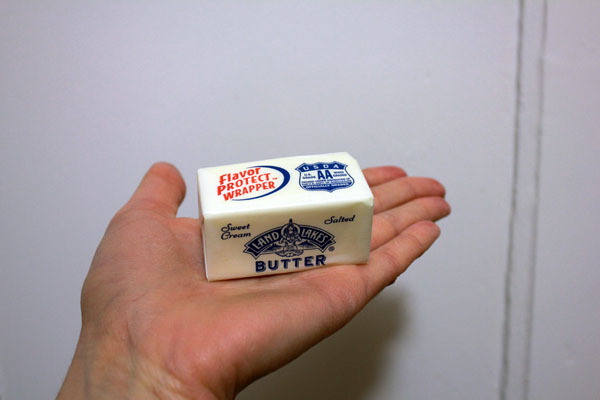 Is that not the cutest stick of butter ever?! I don’t really keep butter in the house, as I don’t need it very often. 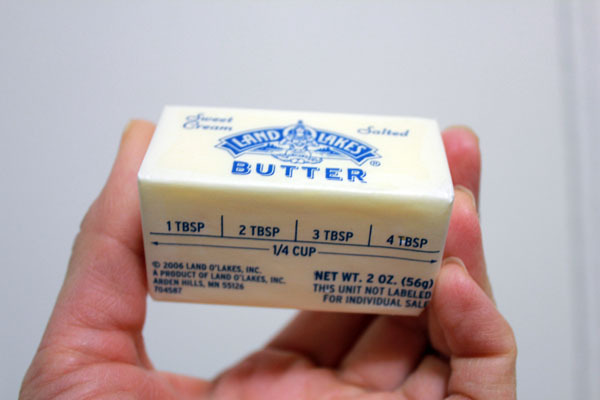 At Christmas time, however, I had planned to make chocolate chip cookies, so I had bought this butter. I remember choosing this box because it came in half sticks. 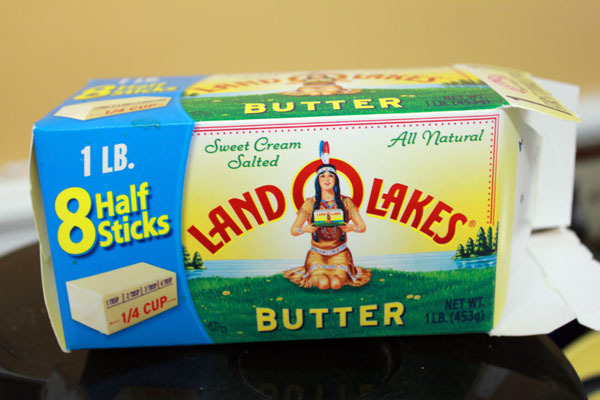 I never made the cookies and I never opened this box of adorable butter. So I was all surprised and excited when I got to use one of these mini butter sticks. Combine well and pour into a baking dish of your choice. Bake for 20-30 minutes at 350 degrees F. Cornbread is done when a toothpick/knife inserted comes out clean. Now as I’ve mentioned, the main way I eat cornbread is crumbled in milk. As a matter of fact, it is the ONLY reason I EVER make cornbread. I don’t make it to go with chili or soup…I prefer crackers. I don’t make it to go on the side of a southern meal or for any other “normal” reason. I make it when I want to eat bread ‘n’ milk. This is what bread ‘n’ milk looks like. Yes. I took two slices for my bowl. It’s how I roll. 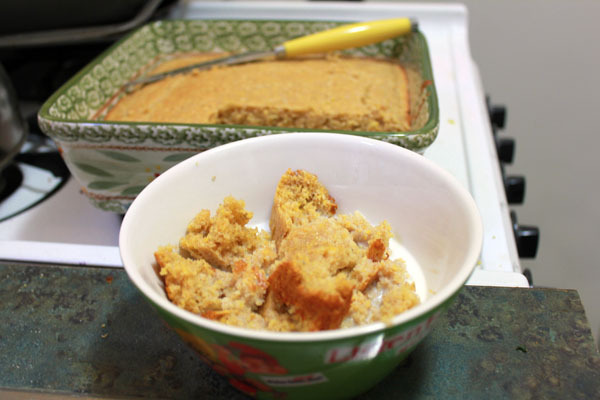 Overall, I thought the spelt cornbread was pretty good! I won’t lie though, it isn’t Jiffy. I was sort of okay with that though. This was much heartier. One of my big problems with making cornbread is portion control. I usually have to make it in muffin tins so I don’t keep going back. Sometimes bread ‘n’ milk doesn’t really fill me up and I end up eating several servings of cornbread. This time, I was satisfied with the two hunks I cut out of my loaf. It actually staved off hunger for about 4-5 hours, which isn’t bad at all. I know I will eat Jiffy again, but for now, this will do. What is your favorite way to eat cornbread? By itself as a snack: warmed up, cut in half, and slathered with butter. I think this version would be most excellent served that way. I’m glad I used butter…gave it great flavor. I can’t imagine MORE (cute!) butter would in any way be a bad thing. I have to say, hearing that you don’t usually keep butter on hand gave me a sad. Butter is awesome. Hooray for dairy fat! It isn’t for any particular reason. I just don’t use a lot of butter. I prefer peanut butter or jam on toast and I use olive oil when cooking most things. I mean, I had an entire pound of butter in my fridge and I didn’t even notice it until this morning! Love a good cornbread. This looks fantastic. Thanks! As I say, it was pretty good! This looks so good! When I was a kid, cornbread was one of the only foods that I HATED. Just the sight of it made me nauseous. I have no idea why! I tried it again a few months ago and loved it. Isn’t it weird how tastes can change like that? I can’t believe you ever hated cornbread…what’s up with that?! I like it warm with butter and honey! I loved the way you told a little story and about the excitement you had with the cute stick of butter. I love those, too. Do you think low fat regular milk would work as well, or have you tried it? I also like ver much crumbling up cornbread in a cold glass of milk. Thank you.